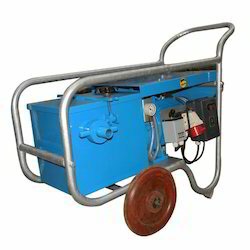 Leading Manufacturer of vacuum dewatering pump from Nagpur. Through the Vacuum Dewatering Pump it is possible to reduce the water content in the concrete by 15-25% which greatly increases the compressive strength. Thus by lowering the water, tendency of shrinking and subsequent cracking is greatly reduced. cement ratio being at the top part of a vacuum dewatered slab, gives it the maximum compressive strength. Looking for Vacuum Dewatering Pump ?